Magnets are an important part of our daily lives, serving as essential components in everything from electric motors, loudspeakers, computers, compact disc players, microwave ovens and the family car, to instrumentation, production equipment, and research. Their contribution is often overlooked because they are built into devices and are usually out of sight. ► Mechanical to Mechanical - attraction and repulsion. Examples of applications that utilize this are magnetic separators, holding devices, magnetic torque drivers and magnetic bearings. ► Mechanical to Electrical - the conversion of motion to electrical energy. Example applications are generators, magnetos, and microphones. ► Electrical to Mechanical - the conversion of electrical energy to motion. Example applications are motors, meters, relays, actuators, loudspeakers, and charged particle deflection, traveling wave tubes, ion pumps, and cyclotrons. ► Mechanical to Heat - the conversion of motion to heat energy. Example applications are eddy current heaters. ► Special Effects - such as magneto resistance, Hall effect devices, and magnetic resonance. The following sections will provide a brief insight into the design and application of technical permanent magnets. The design & engineering team at Integrated Magnetics will be happy to assist you further in your applications, Contact us or send us a request for quote and let us know how we can help. NdFeB and SmCo are collectively known as rare-earth magnets because they are both composed of materials from the Rare Earth group of elements. Neodymium Iron Boron (general composition Nd2Fe14B, often abbreviated to NdFeB) is the most recent commercial addition to the family of modern magnet materials. 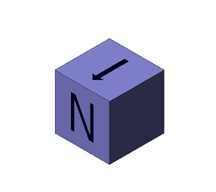 At room temperatures, NdFeB magnets exhibit the highest properties of all magnet materials. Samarium Cobalt is manufactured in two compositions: Sm1Co5 and Sm2Co17 - often referred to as the SmCo 1:5 or SmCo 2:17 types. 2:17 types, with higher Hci values, offer greater inherent stability than the 1:5 types. Ferrite, also known as ceramic magnets (general composition BaFe2O3 or SrFe2O3) have been commercialized since the 1950s and continue to be extensively used today due to their low cost. A special form of Ferrite magnet is "Flexible" material, made by bonding Ferrite powder in a flexible binder. Alnico magnets (general composition Al-Ni-Co) were commercialized in the 1930s and are still extensively used today. * Tmax (maximum practical operating temperature) is for reference only. The maximum practical operating temperature of any magnet is dependent on the circuit the magnet is operating in. Three systems of units of measure are common: the cgs (centimeter, gram, second), SI (meter, kilogram, second), and English (inch, pound, second) systems. Here we have used the cgs system for magnetic units, unless otherwise specified. Click here for an interactive version of this conversion table. Basic problems of permanent magnet design revolve around estimating the distribution of magnetic flux in a magnetic circuit, which may include permanent magnets, air gaps, high permeability conduction elements, and electrical currents. Exact solutions of magnetic fields require complex analysis of many factors, although approximate solutions are possible based on certain simplifying assumptions. Obtaining an optimum magnet design often involves experience and tradeoffs. Finite Element Analysis (FEA) modeling programs are used to analyze magnetic problems in order to arrive at more exact solutions, which can then be tested and fine-tuned against a prototype of the magnet structure. Using FEA models flux densities, torques, and forces may be calculated. Results can be output in various forms, including plots of vector magnetic potentials, flux density maps, and flux path plots. The Design & Engineering team at Integrated Magnetics has extensive experience in many types of magnetic designs and is able to assist in the design and execution of FEA models. 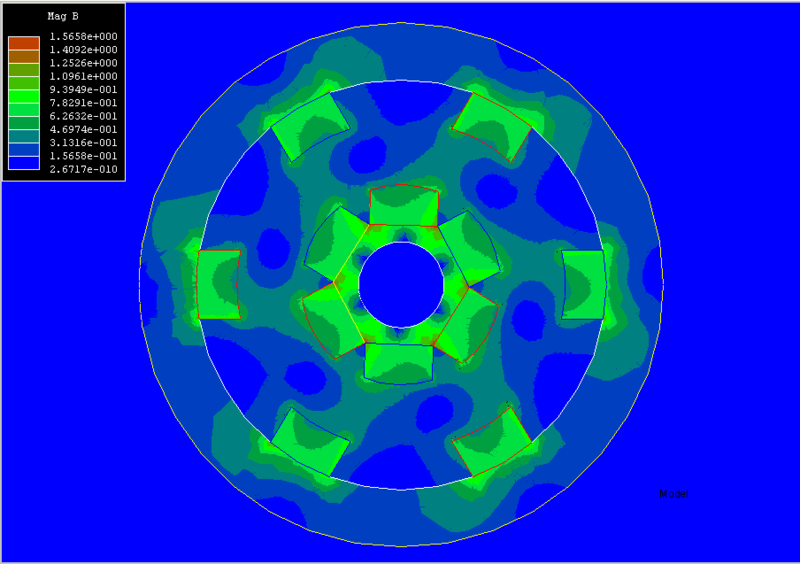 To learn more, visit our Finite Element Analyses page. The basis of magnet design is the B-H curve, or hysteresis loop, which characterizes each magnet material. This curve describes the cycling of a magnet in a closed circuit as it is brought to saturation, demagnetized, saturated in the opposite direction, and then demagnetized again under the influence of an external magnetic field. The second quadrant of the B-H curve, commonly referred to as the "Demagnetization Curve", describes the conditions under which permanent magnets are used in practice. A permanent magnet will have a unique, static operating point if air-gap dimensions are fixed and if any adjacent fields are held constant. Otherwise, the operating point will move about the demagnetization curve, the manner of which must be accounted for in the design of the device. 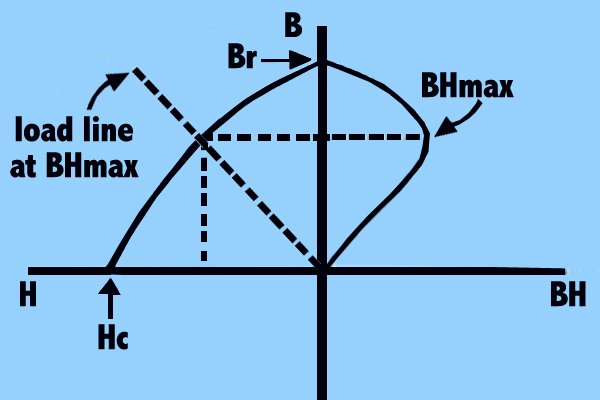 The three most important characteristics of the B-H curve are the points at which it intersects the B and H axes (at Br - the residual induction - and Hc - the coercive force - respectively), and the point at which the product of B and H are at a maximum (BHmax - the maximum energy product). Br represents the maximum flux the magnet is able to produce under closed circuit conditions. In actual useful operation, permanent magnets can only approach this point. Hc represents the point at which the magnet becomes demagnetized under the influence of an externally applied magnetic field. BHmax represents the point at which the product of B and H, and the energy density of the magnetic field into the air gap surrounding the magnet, is at a maximum. The higher this product, the smaller need be the volume of the magnet. Designs should also account for the variation of the B-H curve with temperature. This effect is more closely examined in the section entitled "Permanent Magnet Stability". When plotting a B-H curve, the value of B is obtained by measuring the total flux in the magnet (φ) and then dividing this by the magnet pole area (A) to obtain the flux density (B=φ/A). The total flux is composed of the flux produced in the magnet by the magnetizing field (H), and the intrinsic ability of the magnet material to produce more flux due to the orientation of the domains. The flux density of the magnet is therefore composed of two components, one equal to the applied H, and the other created by the intrinsic ability of ferromagnetic materials to produce flux. The intrinsic flux density is given the symbol Bi where total flux B = H + Bi, or, Bi = B - H. In normal operating conditions, no external magnetizing field is present, and the magnet operates in the second quadrant, where H has a negative value. Although strictly negative, H is usually referred to as a positive number, and therefore, in normal practice, Bi = B + H. It is possible to plot an intrinsic as well as a normal B-H curve. The point at which the intrinsic curve crosses the H axis is the intrinsic coercive force, and is given the symbol Hci. High Hci values are an indicator of inherent stability of the magnet material. The normal curve can be derived from the intrinsic curve and vice versa. In practice, if a magnet is operated in a static manner with no external fields present, the normal curve is sufficient for design purposes. When external fields are present, the normal and intrinsic curves are used to determine the changes in the intrinsic properties of the material. Lm = the magnet length. where µ is the permeability of the medium, and k is a factor which takes account of leakage and reluctance that are functions of the geometry and composition of the magnetic circuit. The permeance coefficient is a useful first order relationship, helpful in pointing towards the appropriate magnet material, and to the approximate dimensions of the magnet. The objective of good magnet design is usually to minimize the required volume of magnet material by operating the magnet at BHmax. The permeance coefficient at which BHmax occurs is given in the Material Properties Charts. We can compare the various magnet materials for general characteristics using equation 3 above. Consider that a particular field is required in a given air-gap, so that the parameters Bg, Hg (air-gap magnetizing force), Ag, and Lg are known. Alnico 5 has the ability to provide very high levels of flux density Bm, which is often desirable in high performance electromechanical devices. This is accompanied, however, by a low coercivity Hm, and so some considerable magnet length will be required. Alnico 8 operates at a higher magnetizing force, Hm, needing a smaller length Lm, but will yield a lower Bm, and would therefore require a larger magnet area Am. Rare Earth Materials offer reasonable to high values of flux density at very high values of magnetizing force. Consequently, very short magnet lengths are needed, and the required volume of this material will be small. Ferrite operates at relatively low flux densities, and will therefore need a correspondingly greater pole face area, Am. The permeance coefficient method using the demagnetization curves allows for initial selection of magnet material, based upon the space available in the device, this determining allowable magnet dimensions. Click here to calculate flux density of rectangular or cylindrical magnets in various configurations. For Magnet Materials with straight-line normal demagnetization curves such as Rare Earths and Ceramics, it is possible to calculate with reasonable accuracy the flux density at a distance X from the pole surface (where X>0) on the magnet's centerline under a variety of conditions. Table 4.1 shows flux density calculations for a magnet 0.500" in diameter by 0.250" long at a distance of 0.050" from the pole surface, for various materials. Note that you may use any unit of measure for dimensions; since the equation is a ratio of dimensions, the result is the same using any unit system. The resultant flux density is in units of gauss. Substitute 2L in the above formulae. The value of Bx at the gap center is double the value of Bx in case 3. At a point P, Bp is the sum of B(x-p) and B(x-p), where (X+P) and (X-P) substitute for X in case 3. Substitute 2L for L in case 4, and adopt the same procedure to calculate Bp. where Br is the residual flux density of the material, A is the pole area in square inches, and Lm is the magnetic length. Click here to Calculate Approximate Pull of a rectangular or disc magnet. This formula is only intended to give an order of magnitude for the holding force that is available from a magnet with one pole in direct contact with a flat, machined, steel surface. The formula can only be used with straight-line demagnetization curve materials - i.e. for rare earth and ferrite materials - and where the magnet length, Lm, is kept within the bounds of normal, standard magnet configurations. These losses are defined as partial demagnetization of the magnet from exposure to high or low temperatures. These losses are only recoverable by re-magnetization, and are not recovered when the temperature returns to its original value. These losses occur when the operating point of the magnet falls below the knee of the demagnetization curve. An efficient permanent magnet design should have a magnetic circuit in which the magnet operates at a permeance coefficient above the knee of the demagnetization curve at expected elevated temperatures. This will prevent performance variations at elevated temperatures. ► Tmax is the maximum practical operating temperatures* for general classes of major materials. Different grades of each material exhibit values differing slightly from the values shown here. * Note that the maximum practical operating temperature is dependent on the operating point of the magnet in the circuit. The higher the operating point on the Demagnetization Curve, the higher the temperature at which the magnet may operate. Flexible materials are not included in this table since the binders that are used to render the magnet flexible break down before metallurgical changes occur in the magnetic ferrite powder that provides flexible magnets with their magnetic properties. Partially demagnetizing a magnet by exposure to elevated temperatures in a controlled manner stabilizes the magnet with respect to temperature. The slight reduction in flux density improves a magnet's stability because domains with low commitment to orientation are the first to lose their orientation. A magnet thus stabilized will exhibit constant flux when exposed to equivalent or lesser temperatures. Moreover, a batch of stabilized magnets will exhibit lower variation of flux when compared to each other since the high end of the bell curve which characterizes normal variation will be brought in closer to the rest of the batch. These changes occur when a magnet is subjected to permeance changes such as changes in air gap dimensions during operation. These changes will change the reluctance of the circuit, and may cause the magnet's operating point to fall below the knee of the curve, causing partial and/or irreversible losses. The extents of these losses depend upon the material properties and the extent of the permeance change. Stabilization may be achieved by pre-exposure of the magnet to the expected reluctance changes. External magnetic fields in repulsion modes will produce a demagnetizing effect on permanent magnets. Rare Earth Magnets with coercive forces exceeding 15 KOe are difficult to affect in this manner. However, Alnico 5, with a coercive force of 640 Oe will encounter magnetic losses in the presence of any magnetic repelling force, including similar magnets. Applications involving Ferrite Magnets with coercive forces of approximately 4KOe should be carefully evaluated in order to assess the effect of external magnetic fields. Rare Earth Materials are commonly used in charged particle beam deflection applications, and it is necessary to account for possible radiation effects on magnetic properties. Studies (A.F. Zeller and J.A. Nolen, National Superconducting Cyclotron Laboratory, 09/87, and E.W. Blackmore, TRIUMF, 1985) have shown that SmCo and especially Sm2Co17 withstand radiation 2 to 40 times better than NdFeB materials. SmCo exhibits significant demagnetization when irradiated with a proton beam of 109 to 1010 rads. NdFeB test samples were shown to lose all of their magnetization at a 7 x 107 rads, and 50% at a dose of 4 x 106 rads. In general, it is recommended that magnet materials with high Hci values be used in radiation environments, that they be operated at high permeance coefficients, Pc, and that they be shielded from direct heavy particle irradiation. Stabilization can be achieved by pre-exposure to expected radiation levels. Below destructive limits, these effects are very minor on modern magnet materials. However, rigid magnet materials are brittle in nature, and can easily be damaged or chipped by improper handling. Samarium Cobalt in particular is a fragile material and special handling precautions must be taken to avoid damage. Thermal shock when Ferrites and Samarium Cobalt Magnets are exposed to high temperature gradients can cause fractures within the material and should be avoided. The sintering process involves compacting fine powders at high pressure in an aligning magnetic field, then sintering to fuse into a solid shape. After sintering, the magnet shape is rough, and will need to be machined to achieve close tolerances. The intricacy of shapes that can be thus pressed is limited. Rare Earth Magnets may be die pressed (with pressure being applied in one direction) or isostatically pressed (with equal pressure being applied in all directions). Isostatically pressed magnets achieve higher magnetic properties than die pressed magnets. The aligning magnetic field for die pressed magnets can be either parallel or perpendicular to the pressing direction. Magnets pressed with the aligning field perpendicular to the pressing direction achieve higher magnetic properties than the parallel pressed form. Both Rare Earth and Ferrite Magnets can also be manufactured by pressure bonding or injection molding the magnet powders in a carrier matrix. The density of magnet material in this form is lower than the pure sintered form, yielding lower magnetic properties. However, bonded or injection molded magnets may be made with close tolerances "off-tool" and in relatively intricate shapes. Alnico is manufactured in a cast or sintered form. Alnicos may be cast in large or complex shapes (such as the common horseshoe), while sintered Alnico Magnets are made in relatively small sizes (normally one ounce or less) and in simple shapes. Flexible Rare Earth or Ferrite magnets are made by calendering or extruding magnet powders in a flexible carrier matrix such as vinyl. Magnet powder densities and therefore magnetic properties in this form of manufacture are even lower than the bonded or injection molded form. Flexible Magnets are easily cut or punched to shape. Visit our Manufacturing & Assembly page to learn more about our specialty capabilities. Sintered Samarium Cobalt and Ceramic magnets exhibit small cracks within the material that occur during the sintering process. Provided that cracks do not extend more than halfway through a section, they do not normally affect the operation of the magnet. This is also true for small chips that may occur during machining and handling of these magnets, especially on sharp edges. Magnets may be tumbled to break edges: this is done to avoid "feathering" of sharp edges due to the brittle nature of the materials. Tumbling can achieve edge breaks of 0.003" to 0.010". Although Neodymium Iron Boron is relatively tough as compared to Samarium Cobalt and Ceramic, it is still brittle and care must be taken in handling. Because of these inherent material characteristics, it is not advisable to use any permanent magnet material as a structural component of an assembly. Rare Earth, Alnico, and Ceramic magnets are machined by grinding, which may considerably affect the magnet cost. Maintaining simple geometries and wide tolerances is therefore desirable from an economic point of view. Rectangular or round sections are preferable to complex shapes. Square holes (even with large radii), and very small holes are difficult to machine and should be avoided. Magnets may be ground to virtually any specified tolerance. However, to reduce costs, tolerances of less than + 0.001" should be avoided if possible. Cast Alnico Materials exhibit porosity as a natural consequence of the casting process. This may become a problem with small shapes, which are machined out of larger castings. The voids occupy a small portion of the larger casting, but can account for a large portion of the smaller fabricated magnets. This may cause a problem where uniformity or low variation is critical, and it may be advisable either to use a sintered Alnico, or another material. In spite of its slightly lower magnetic properties, sintered Alnico may yield a higher or more uniform net density, resulting in equal or higher net magnetic output. Integrated Magnetics has extensive experience in the machining and handling of all permanent magnet materials. Our in-house Machining Facilities allow the ability to deliver prototype to production quantities with short lead times. 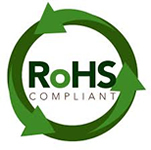 Contact Us or send us a RFQ and let us know how we can help. Samarium Cobalt, Alnico, and Ferrite materials are corrosion resistant, and do not require to be coated against corrosion. Alnico is easily plated for cosmetic qualities, and Ferrites may be coated to seal the surface, which will otherwise be covered by a thick film of ferrite powder (although not a problem for most applications). Neodymium Iron Boron Magnets are susceptible to corrosion and consideration should be given to the operating environment to determine if coating is necessary. Nickel or tin plating may be used for Neodymium Iron Boron magnets, however the material must be properly prepared and the plating process properly controlled for successful plating. 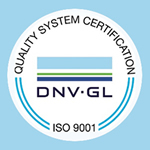 Plating houses experienced in the plating of NdFeB materials are difficult to locate, and must be furnished with the necessary information for proper preparation and control of the process. Aluminum chromate or cadmium chromate vacuum deposition has been successfully tested, with coating thickness as low as 0.0005". Teflon and other organic coatings are relatively inexpensive and have also been successfully tested. A further option for critical applications is to apply two types of protective coatings or to encase the magnet in a stainless steel or other housing to reduce the chances of corrosion. Integrated Magnetics has Manufacturing Capabilities to manufacturer complex magnet pole pieces and housings to provide a complete magnet assembly. The following points should be considered when designing magnet assemblies. Magnets can be successfully affixed to housings using adhesives. Cyanoacrylate adhesives that are rated to temperatures up to 350º F with fast cure times are most commonly used. Fast cure times avoid the need for fixtures to hold the magnets in place while the bond cures. Adhesives with higher temperature ratings are also available, but these require oven curing, and fixturing of the magnets to hold them in place. If magnet assemblies are to be used in a vacuum, potential out-gassing of the adhesives should be considered. Integrated Magnetics is equipped with state of the art CNC and EDM equipment allowing the manufacture of complex housings. Effective magnet locating sections should be included in housing designs to support and locate magnets precisely. When arrays of magnets must be assembled, especially when the magnets must be placed in repelling positions, it is very important to consider safety issues. Modern magnet materials such as the Rare Earths are extremely powerful, and when in repulsion they can behave as projectiles if adhesives were to break down. We strongly recommend that in these situations, mechanical fastening be included in the design in addition to adhesives. Potential methods of mechanical retention include encasement, pinning, or strapping the magnets in place with non-magnetic metal components. Our Design Engineering team is experienced in magnet housing and fastening designs, and we will be pleased to assist in helping you arrive at an appropriate design. Contact Us or send us a RFQ and let us know how we can help. Magnet assemblies may be potted to fill gaps or to cover entire arrays of magnets. Potting compounds cure to hard and durable finishes, and are available to resist a variety of environments, such as elevated temperatures, water flow, etc. When cured, the potting compounds may be machined to provide accurate finished parts. Assemblies that require to be hermetically sealed can be welded using either laser welding (which is not effected by the presence of magnetic fields) or TIG welding (using appropriate shunting elements to reduce the effect of magnetic fields on the weld arc), Special care should be taken when welding magnetic assemblies so that heat dissipation of the weld does not affect the magnets. Permanent Magnet Materials are believed to be composed of small regions or "domains" each of which exhibit a net magnetic moment. An unmagnetized magnet will possess domains that are randomly oriented with respect to each other, providing a net magnetic moment of zero. Thus, a magnet when demagnetized is only demagnetized from the observer's point of view. Magnetizing fields serve to align randomly oriented domains to give a net, externally observable field. The objective of magnetization is initially to magnetize a magnet to saturation, even if it will later be slightly demagnetized for stabilization purposes. Saturating the magnet and then demagnetizing it in a controlled manner ensures that the domains with the least commitment to orientation will be the first to lose their orientation, thereby leading to a more stable magnet. Not achieving saturation, on the other hand, leads to orientation of only the most weakly committed domains, hence leading to a less stable magnet. Anisotropic magnets must be magnetized parallel to the direction of orientation to achieve optimum magnetic properties. Isotropic magnets can be magnetized through any direction with little or no loss of magnetic properties. Slightly higher magnetic properties are obtained in the pressing direction. Magnetization is accomplished by exposing the magnet to an externally applied magnetic field. This magnetic field may be created by other permanent magnets, or by currently flowing in coils. Using permanent magnets for magnetization is only practical for low coercivity or thin sections of materials. Removal of the magnetized specimen from the permanent magnet magnetizer can be problematic since the field cannot be turned off, and fringing fields may adversely affect the magnetization of the specimen. DC magnetizers employ large coils through which a current is applied for a short duration by closing a switch. The current flowing through the coil produces a magnetic field, which is usually directed by the use of iron cores and pole pieces, and magnets are placed in the gap between the pole pieces. DC magnetizers are only practical for magnetizing Alnico Materials, which have a low magnetizing force requirement, or small sections of Ferrite Materials. Capacitor discharge magnetizers employ capacitor banks that are charged, and then discharged through a coil. Provided the coil has a resistance, R, which is greater than , where L is the inductance and C the capacitance, the current flowing through the coil will be unidirectional. Extremely high magnetizing fields (in the range of 100 KOe) can be achieved using special coils and power supplies. Some Rare-Earth magnets require very high magnetizing fields in the 20 to 50 KOe range. These fields are difficult to produce requiring large power supplies in conjunction with carefully designed magnetizing fixtures. Isotropic bonded Neodymium materials require fields in the high 60 KOe range to be fully saturated. However, fields in the 30 KOe range may achieve 98% of saturation. Ceramics require fields in the order of 10 KOe, while Alnicos require fields in the range of 3 KOe for saturation. Because of the ease by which Alnico 5 can become inadvertently demagnetized, it is preferable for this material to be magnetized just prior to or even after final assembly of the magnet into the device. In certain cases, it may be desirable to magnetize a magnet with more than one pole on a single pole surface. This may be accomplished by constructing special magnetizing fixtures. Multiple pole magnetizing fixtures are relatively simple to build for Alnico and Ceramic, but require great care in design and construction for Rare Earth materials. Magnetizing with multiple poles will sometimes eliminate the need for several discrete magnets, reducing assembly costs, although a cost will be incurred for building an appropriate magnetization fixture. Multiple pole fixtures for Rare Earth magnets may cost several thousands of dollars to build, depending on the size of the magnet, the number of poles required, and the fields necessary to achieve saturation. Some applications require magnets oriented in a particular direction with a high degree of accuracy. This direction may or may not coincide with a geometric plane of the magnet. For anisotropic materials, the orientation direction can normally be held within 3º of the nominal with no special precautions. However, more precise requirements may need special measurement and testing. This is achieved by the use of Helmholtz coils, which measure the total flux in various axes, and thence calculating the resultant magnetic moment vector. Materials must be cut and machined taking into account the actual angle of orientation to achieve the required accuracy. Isotropic materials may be magnetized in any direction, and therefore pose no problem in this regard. It is important that incoming inspection of magnetic characteristics be clearly and properly specified. End point characteristics (such as Br or Hc) cannot be directly observed; therefore, inspection personnel should not expect to measure 8,500 Gauss on a SmCo 18 magnet even though the Br is specified at 8,500 Gauss. A test method or combination of test methods should be based upon the criticality of the requirement, and the cost and ease of performing tests. Ideally, the test results should be able to be directly translated into functional performance of the magnet. A sampling plan should be specified which inspects the parameters which are critical to the application. A brief description of some common test methods follows below. B-H curves may be plotted with the use of a permeameter. These curves completely characterize the magnetic properties of the material at a specific temperature. In order to plot a B-H curve, a sample of the specific size must be used, then cycled through a magnetization/demagnetization cycle. This test is expensive to perform due to the length of time required to complete. The test is destructive to the sample piece in many cases, and is not practical to perform on a large sample of finished magnets. However, when magnets are machined from a larger block, the supplier may be requested to provide B-H curves for the starting raw stock of magnet material. Using a test set up consisting of Helmholtz coil pair connected to a fluxmeter, total flux measurements can be made to obtain total dipole moments, and interpolated to obtain close estimates of Br, Hc, and BHmax. The angle of orientation of the magnet can also be determined using this method. This is a quick and reliable test, and one that is not overly sensitive to magnet placement within the coil. Flux density measurements are made using a gaussmeter and an appropriate probe. The probe contains a Hall Effect device whose voltage output is proportional to the flux density encountered. Two types of probe construction (axial, where the lines of flux traveling parallel to the probe holder, and transverse, where the lines of flux traveling perpendicular to the probe holder, are measured) allow the measurement of flux density of magnets in various configurations. The placement of the probe with respect to the magnet is critical in order to obtain comparable measurements from magnet to magnet. This is accomplished by building a holding fixture for the magnet and probe, so that their positions are fixed relative to each other. Using special scanners equipped with 3- axis Hall probes, magnetic arrays can be mapped, to capture flux densities in x, y, and z directions with a specified number of data points across the entire array. The resulting data can then be output as a flux contour map, as flux vectors, or as a data table for further analysis. This is a commonly used test for magnets. The pull of a magnet is proportional to B2, and is therefore very sensitive to the value of B. Variations in B occur due to variations in the inherent properties of the magnet itself, as well as environmental effects such as temperature, composition, and condition of the material that the magnet is being tested on, measurement equipment, and operator. Since B decays exponentially from a zero-air gap, small inadvertently introduced air gaps between the magnet and the test material can have a large effect on the measured pull. It is therefore recommended that pull be tested at a positive air gap. Performing pull tests at a number of air gaps and plotting results as air gap vs.ˆš (pull), provides a more accurate description of the pull characteristics of the magnet. Extrapolating from this pull at zero air-gap may be calculated. Click here for the on-line MDFA Standard for testing pull of a magnet. These should be determined according to the application and after discussion with the supplier. They may involve complex tests such as a profile of flux density along a specified axis, flux uniformity requirements within a defined volume, or relatively simple tests such a torque test. Please Handle Magnets with Care! Personnel wearing pacemakers should not handle magnets. Magnets should be kept away from sensitive electronic equipment. Modern magnet materials are extremely strong magnetically and somewhat weak mechanically. Any person required to handle magnets should be appropriately trained about the potential dangers of handling magnets. Injury is possible to personnel, and magnets themselves can easily get damaged if allowed to snap towards each other, or if nearby metal objects are allowed to be attracted to the magnets. 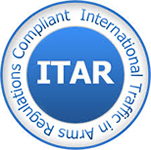 Note that magnets are classified as dangerous goods for air transportation purposes, and strict air shipment rules must be followed for this purpose regarding packaging, labeling and certifications. Click here to learn more. Materials with low coercive forces such as Alnico 5 must be carefully handled and stored when received in a magnetized condition. When stored, these magnets should be maintained on a "keeper" which provides a closed loop protecting the magnet from adverse fields. Bringing together like poles in repulsion would lead to irreversible, though re-magnetizable, losses. Samarium Cobalt should be carefully handled and stored due to the extremely brittle nature of the material. Click here to learn more about SmCo characteristics. Uncoated Neodymium magnets should be stored so as to minimize the risk of corrosion. Click here to learn more about Neo characteristics. In general, it is preferable to store magnetized materials under vacuum-sealed film so that the magnets do not collect ferromagnetic dust particles over time, since cleaning this accumulated dust is time consuming. When requesting design assistance, information should establish adverse conditions to which the magnet may be subjected - for example unusual temperatures, humidity, radiation, demagnetizing fields produced by other parts of the magnetic circuit, etc. The various magnet materials react differently under different environmental conditions, and it is most likely that a material can be selected which will maximize the chances of success, provided that all relevant information is conveyed. The Design & Engineering team at Integrated Magnetics will be happy to assist you further in your applications, Contact Us or send us a RFQ and let us know how we can help.